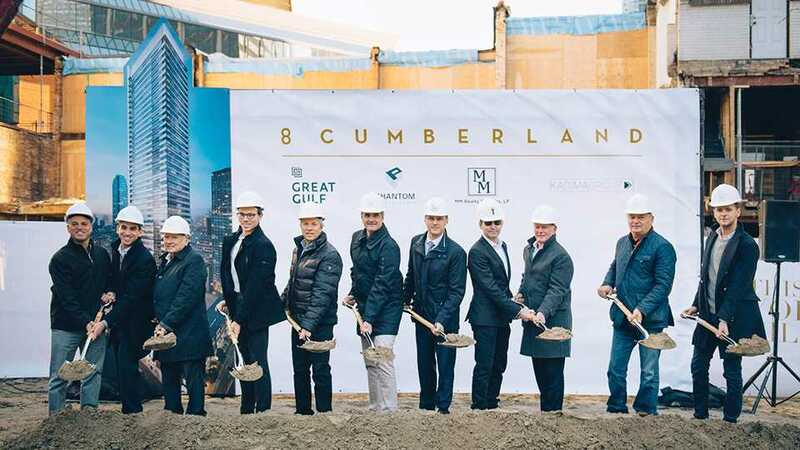 Award-winning developers Great Gulf and Phantom Developments Ltd., along with The Kadima Group and MM Realty Ventures Inc. celebrated the ground-breaking of 8 Cumberland, a modern 51-storey highrise condominium with a century-old brick Victorian podium. Located at the north-west corner of Cumberland Avenue and Yonge Street, it will pay homage to Yorkville’s timeless heritage and the neighbourhood’s revitalization. Conveniently situated near two subway intersections, Canada’s most exclusive shopping district and one of the best cultural and art destinations in the world, 8 Cumberland is a sculpture with ribbons of gleaming steel and luminous glass creating a stunning façade. The masterplan includes parks and open spaces with pedestrian mews that will connect Yorkville Avenue to Cumberland Street and eventually to Bloor Street. “8 Cumberland will create a new gateway to the Yorkville District. Our commitment to the neighbourhood’s revitalization includes a 36-storey condo tower at 18 Yorkville, the iconic 76-storey condo tower at One Bloor east and this 51-storey condo development all within a block radius. I would like to thank our partners Phantom Developments, The Kadima Group and MM Realty Ventures Inc. for sharing our vision in developing this project,” says Great Gulf President, Residential Niall Collins. Designed by Architects Alliance with interior designs by Thomas Pearce and landscape architecture by NAK Design, this sleek and stylish building will feature retail on the ground and second floor within the heritage building dating back to the late 19th century. With 371 units ranging from 468 – 1845 sq. ft., the spacious open-concept suites offer panoramic city views and state-of-the-art amenities.